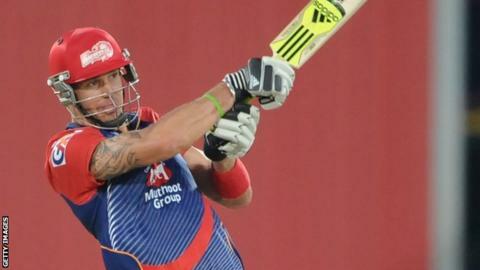 Ex-England batsman Kevin Pietersen says he is not out to make a point when the Indian Premier League gets under way. Pietersen, 33, was told he was no longer part of the national team's plans after the Ashes whitewash. England's only player in the IPL will captain Delhi Daredevils, who paid £880,000 to re-sign him in the auction. "I never play cricket to make any point," said Pietersen. "I love playing cricket. I just want to go out there and enjoy the game." Surrey's Pietersen scored his first T20 century for Delhi in 2012 and has 634 runs in the IPL at an average of 42.26 but missed last year's tournament because of injury. England's all-time leading run-scorer across all formats, he will now be available for a full IPL season for the first time following the end of his international career. England were whitewashed 5-0 by Australia in the Ashes Test series down under and Pietersen was criticised for the manner of some of his dismissals. He was the third most expensive player in this year's IPL auction behind India's Yuvraj Singh, who was bought by Royal Challengers Bangalore for £1.37m. Alex Hales and Ian Bell were among 10 Englishmen left unsold. The seventh edition of the 20-over tournament, which features eight teams, runs from 16 April to 1 June. The opening matches will be held in the United Arab Emirates to avoid a clash with the country's general election. Games will also be held in Bangladesh before the competition returns to India once polling has concluded. Last year's winners Mumbai Indians - without the retired Sachin Tendulkar - will play in the curtain-raiser against Kolkata Knight Riders in Abu Dhabi on Wednesday. Delhi start their campaign against Royal Challengers in Sharjah, UAE on Thursday. South African all-rounder Jacques Kallis, who retired from Test cricket in December, was bought by the Kolkata Knight Riders. Australian's Mitchell Johnson and David Warner were signed by Kings XI Punjab and Sunrisers Hyderabad respectively.